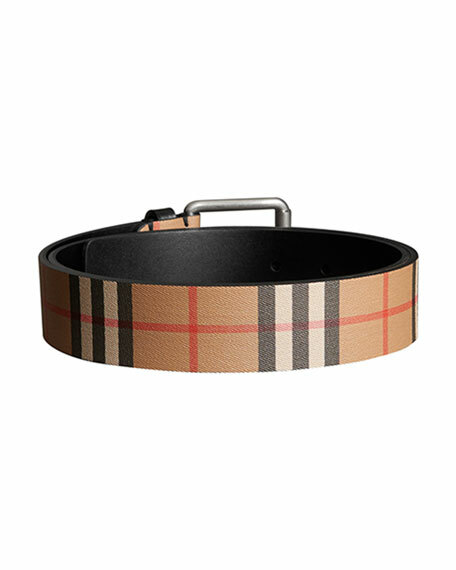 Burberry "Mark" belt in check suede. 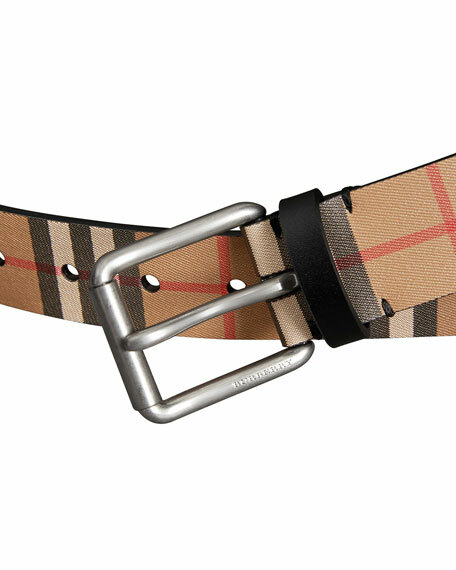 Burberry is a global luxury fashion brand with a distinctive British identity. The brand was established in 1856 by Thomas Burberry who revolutionized rainwear with his invention of gabardine. This heritage remains key to Burberry's iconic outerwear alongside a vision for fashion-forward collections, inspirational runway shows and an industry-leading position in digital technology. Based in London, under the creative direction of Riccardo Tisci, Burberry combines its heritage of innovation and craftsmanship in its design of womenswear, menswear, childrenswear, accessories and beauty. 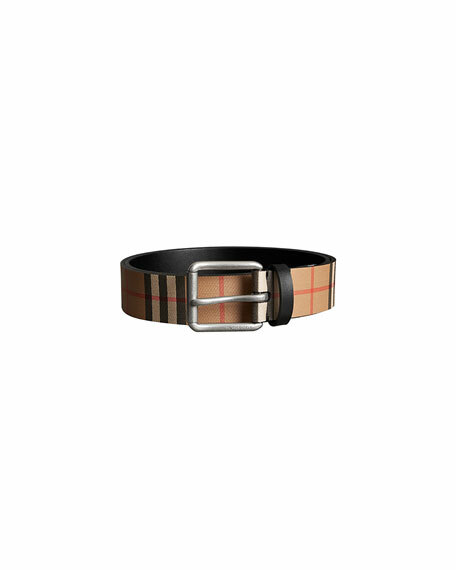 Burberry "Charles" belt in check leather. Polyurethane trim. Made in Italy. 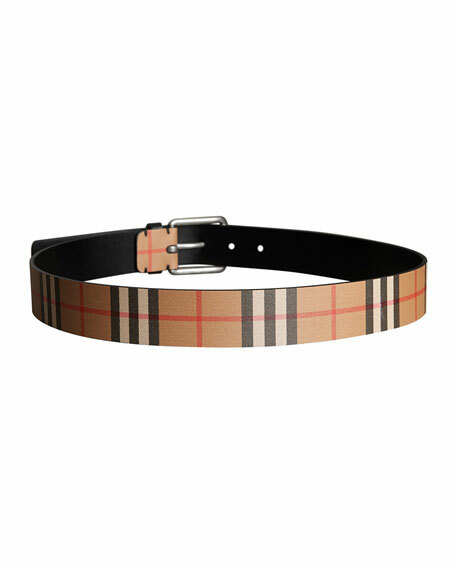 Burberry "Clarke" faux-leather (polyurethane/polyester/cotton) tonal check belt. Polished silvertone hardware. Leather trim. Made in Italy. Burberry convertible nylon and leather belt bag/backpack with silvertone hardware. Adjustable waist strap with clip closure. Adjustable shoulder straps. Two-way zip-top with cord pulls. Exterior, contrast logo. 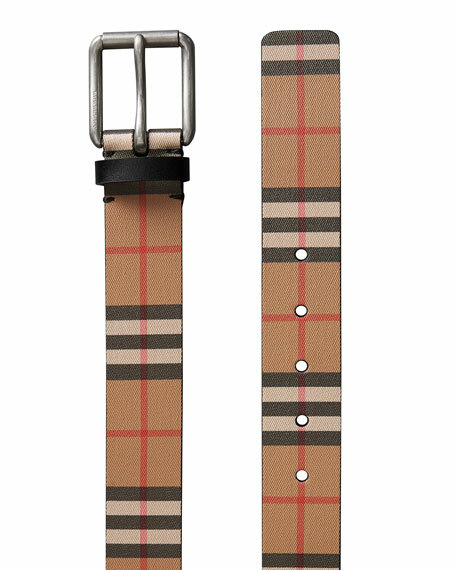 6"H x 14"W x 5"D. Unfolds to 19"H.
Burberry logo-web belt. Tonal metal D-ring buckle. Leather trim. Nylon/polyester. Made in Italy.